I was so intent on finding the solution to overcoming my anxiety and depression that I studied mental health in school, from college to grad school for 7 years, and yet still felt I hadn't even come close to grasping how to manage my own anxiety and depression. I felt very confident about helping others; yet, horribly useless at helping myself. Something was missing; a piece to my puzzle that I had yet to discover. This was my life for over ten years; getting better, to just fall again and start over. It felt like a constant uphill battle, swimming against the current, and I started to feel like nothing was going to work. I started to believe that I'd have to live the rest of my life with this dark cloud constantly hanging over me, rearing its ugly head just when things are starting to look up. Until one day, I fell upon an article that talked about how dogs were able to help people with their mental health, like anxiety and depression. I had always loved dogs; my family had many growing up and they had always been wonderful companions. So I decided I was going to get a dog. I settled on the idea of getting a Pembroke Welsh Corgi because if they were good enough for the Queen, they were good enough for me; not to mention they are hilarious and cute. 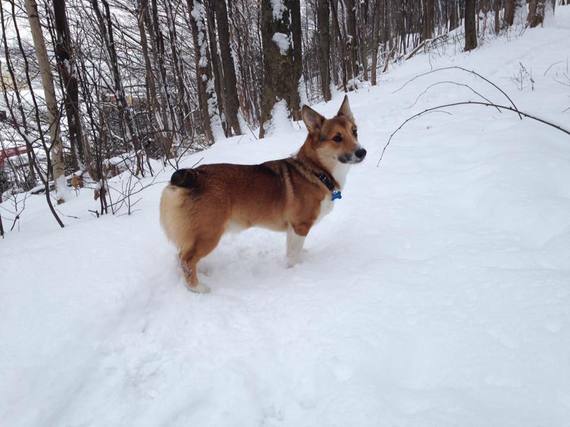 When I brought my little corgi, Buddy, home in November of 2014, I didn't realize at the time how much he would truly change my life. But it didn't happen right away. Once the new puppy excitement went away, the anxiety and depression crept back as it always had. I woke up one morning and felt those familiar feelings again; the weight on my shoulders, the nausea in my stomach, the feelings of hopelessness and worry. I knew that the anxiety and depression had come back hard and felt depleted. I didn't want to get out of bed. It felt impossible. I turned to pull the covers back over my head and give up for the day. What I always did. That's when I came face to face with Buddy. Buddy started jumping all over me, kissing my face, letting me know that it was time to go outside. It was as if he was saying, "It's no time to be sad, the world is awesome!" And for the first time in my life, on a day when my anxiety and depression was present full force, I got out of bed. I put on my winter boots, snow pants, gloves, hat, scarf, coat, and went for a walk in the snow with my new best friend. I realized at that moment, walking down the street in minus 30 degree weather, that my life was changing. I really was a new person. This was my new beginning, my missing puzzle piece. Before Buddy came into my life, I was not able to get enough exercise because there was nothing truly motivating me to exercise, which made my attempts at changing my life to be more active short lived. I wasn't getting enough laughter because as an introverted person, socializing is not my forte, so I don't spend a lot of time with friends or doing activities that promote laughter. And I had a lot of love in my life from my friends and family, but not the kind of unconditional love you get from a dog. The kind of love that greets you at the door every day after a long day of work and just turns everything around. A dog motivates you to get out the door for fresh air and exercise, even when it's the last thing you feel like doing. A dog brings you so much laughter and joy, unlike anything I've experienced before, with their unique personalities and hilarious quirks (search "funny dog videos" and you'll know exactly what I am talking about). And lastly, a dog brings you unconditional love, the kind of love that never stops. With these three things in your life, anxiety and depression can be part of your past as it has become a part of mine. 3. Do I have the money? While dogs do not need to be expensive, it's important to make sure that you have enough money to support their needs. This includes all of their accessories, training tools, food, treats, and vet bills. - Victor Hugo, Les Misérables.